Grohe 38526 Rapid SL 0.82m Dual Flush Cistern Frame + 38732 Cosmo Plate and 3855800M Fixings 38773 38773 This Pack includes... 38526000 - Rapid SL WC frame with front/top access for dual or single flush - 0.82m High 38732000 - Cosmo Air Horizontal/Vertical dual flush wallplate 3855800M Wall brackets for against the wall installation of frame Specifications of the Grohe Rapid SL WC Frame Dual or single flush, 0.82 m installation height, front or top actuation For on-the-wall installations or studded walls Powder coated steel frame, self-supporting For dry-cladding, completely pre-assembled with fixed connections for single or series installation fixing material 2 WC fixing bolts distance of fixing bolts 180/230 mm PP-outlet bend 80/100 mm dia. 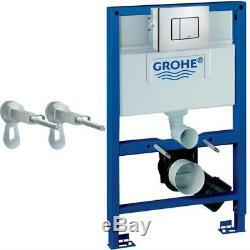 Grohe 38526 Rapid SL 0.82m Dual Flush Cistern Frame + 38732 Cosmo Plate and 3855800M Fixings 38773. 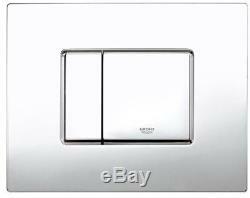 38526000 - Rapid SL WC frame with front/top access for dual or single flush - 0.82m High 38732000 - Cosmo Air Horizontal/Vertical dual flush wallplate 3855800M Wall brackets for against the wall installation of frame. Specifications of the Grohe Rapid SL WC Frame. 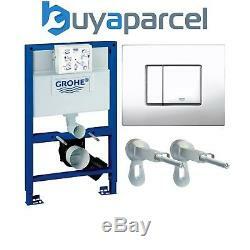 Dual or single flush, 0.82 m installation height, front or top actuation For on-the-wall installations or studded walls Powder coated steel frame, self-supporting For dry-cladding, completely pre-assembled with fixed connections for single or series installation fixing material 2 WC fixing bolts distance of fixing bolts 180/230 mm PP-outlet bend 80/100 mm dia. Inlet and outlet connecting set Dual flush discharge valve pneumatic Connection from left / right or back insulated against condensation With angle stop valve 1/2 and flush pipe. Specifications of the 38732000 Cosmo Air Flush Plate. For horizontal installation for dual flush actuation 156 x 197 mm for pneumatic drop valve made of ABS. Specifications of the 3855800M Wall Brackets. For against-the-wall installations for fixing the elements at the brick-wall or in front of the studded wall steady vertical adjustment from 130 - 230 mm fixing material 2 pieces. The item "GROHE 38526 Rapid SL 3 in 1 WC Set 0.82m Concealed Frame, Cistern, Cosmo Plate" is in sale since Monday, January 8, 2018. This item is in the category "Home, Furniture & DIY\Bath\Toilets & Bidets\Toilets".